One of the most commonly heard calls in the lowland tropical rainforest is that of the 'Little Shrike-thrush', They have beautiful whistles, based on a musical, loud and sudden "tu-ee, wot-wot-wot"
The little shrike-thrush is neither a shrike nor a thrush. 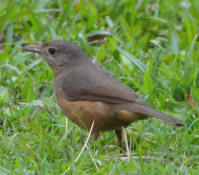 This is a medium-sized bird that is fairly plain olive-brown on top and paler on the face. It is often hard to see. The colouration of the wet tropics subspecies of this tropical Australian bird also results in its other common name of 'Rufous Shrike Thrush'. It is sometimes heard more than seen.